Keep Doing Business Your Way. Nav-to-Net™ is packed with features so you can. Our customers tell us that Nav-to-Net™ is the most feature-rich e-Commerce solution available for NAV. Do your customers need to configure from available options when ordering? Would you like an easy way to edit or add products and descriptions to your site? Do you offter special pricing schemes like BOGO? Nav-to-Net provides everything we need to run multiple online businesses. Beyond the simple elimination of time-consuming and error-prone manual reentry processes, our system now lets us manage our ecommerce sites simply, easily and by non-technical people. We’ve been very happy with both this solution and the support we have received from the team at DVP. They are awesome partners in every way! Payment Integrations– By offering as many payment methods as possible, you can cater to any customer’s preferences. This can include all major credit cards and PayPal, among others. With the tight integration, you and your customers can be confident in the secure payments and protected data at all times. Shipping Agent Integrations– Shipping costs vary depending on region and order size and can affect whether a customer abandons a cart or not. By integrating with multiple shipping agents such as FedEx, UPS, USPS, and Canada Post, customers can see accurate shipping costs. Custom integrations are also available. Other Integrations– At the core of our Nav-to-Net™ solutions is seamless integration to Microsoft Dynamics NAV. With close attention to details and our extensive NAV knowledge and experience, we can achieve very technically sophisticated integration that has benefits all around. This includes integrations to Google Analytics, Google Tag Management, Avalara for sales tax, MS SQL integration, and more! Nav-to-Net™ Configurator, an add-on to the Nav-to-Net e-Commerce suite, is a guided selling wizard integrated with Microsoft Dynamics NAV. The step by step process is managed entirely in NAV and can help guide your customers to better buying decisions while streamlining the sale of customized items. 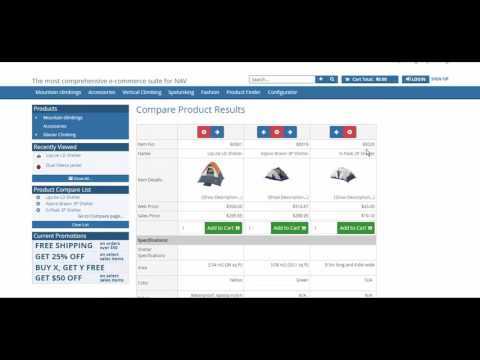 Product Compare aids the decision-making process for your customers. They can easily add, rearrange, and remove items from the list as they compare product details, price, and attributes. Customers can also directly add their desired items from the list to their shopping cart. Discover why integration with Microsoft Dynamics NAV ERP is a game-changer for your online buisness.